There is no doubt that Donald Lee Richardson must have had some connection with New Orleans. 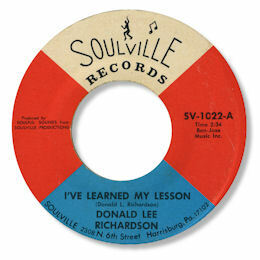 The names of "J. Broussard" and "W Quezergue" on the writer credits for his second 45 make that quite clear, as does the way he sings "loined" for "learned" on "I've Learned My Lesson". 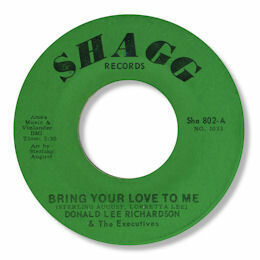 There are also rumours that "Bring Your Love To Me" appeared on the Crescent City Shagg label but I've never seen a copy. And I presume that the way he found himself on a label out of Harrisburg, PA was the same route by which New Orleans DJ Hank Sample appeared on the subsidiary Jay Walking label. Whatever the source of the four sides he cut there is some very fine music here. I've Learned My Lesson is a strong mid paced item with Richardson's flexible and expressive baritone to the fore and some great horn charts back in the mix. This title may just pip the dead slow deep ballad Bring Your Love Home To Me as his best track, although Donald's vocal here is more intense and the arrangement does have the benefit of a male chorus in the background. The dancer "You Got Me In The Palm Of Your Hand" isn't bad either. UPDATE ~ Dave Porter has provided absolute proof of the Shagg 45 by this splendid photo. UPDATE ~ Barry Webster has written to say that "Bring your love home to me" can be found on the CD "Soulful Sounds From Soulville". Thanks to my friend Rod Dearlove (see Links) for the suggestion and to Barry Webster for the update. Special thanks to Dave Porter for the Shagg pic.